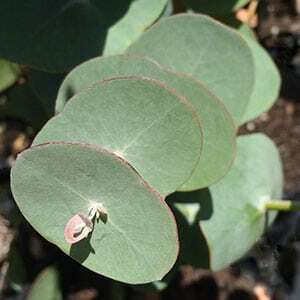 This is an Alpine species, and Eucalyptus perriniana or the ‘Spinning Gum’ is found at higher elevations in Victoria, Tasmania, New South Wales and the ACT. It is the rounded leaves of this plant that make it such an attraction. It gets its common name from the juvenile foliage which is round, the individual leaves form around a central stem. Over time this foliage dies off and dries. At this point it disconnects from the stem and can be found ‘spinning’ around the stem. The mature foliage eventually takes over and this is elongated. In cultivation the plant can be pruned back, or coppiced to encourage more juvenile foliage. This foliage is demand by florists for backing in flower arrangements. 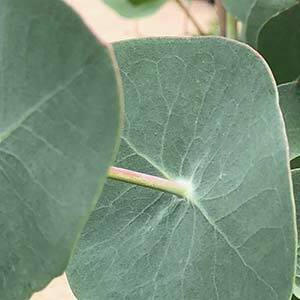 Given a moist well drained soil Eucalyptus perriniana is an easy plant to grow. It will grow larger in warmer climates, however is not suited very hot dry conditions. Common Name – Spinning Gum. Silver Dollar Gum. Botanical Name – Eucalyptus perriniana. Height – Dependant on climate to around 5 – 7 metres. Spread – Will form a crown of 3 – 4 metres. Drought tolerant – Once established, reasonably tolerant. Cold Tolerant – Hardy, even in snow.